A local author and her critique group started their own press- Wednesday Night Press– to “allow readers to learn or experience something new.” I decided to read one of their latest offerings. A girl enters a Farmer’s Market baking contest using her grandma’s recipe- and everyone begins to wonder what the mysterious secret ingredient is. Sweet story and includes a recipe in the back. Enjoyable tale of a girl with a big imagination who transforms her afternoon out in the backyard into a wild jungle adventure. I love the illustrations in this one and readers will definitely enjoy identifying where her imagination ran wild. Portland author/illustrator Allen Say delivers another stunner with his upcoming picture book Silent Days, Silent Dreams. The life of artist James Castle is explored in this imagined biography. Although I read an advanced copy and artwork may not be final, the different styles Allen Say shares is incredible. An author’s note of how the project came to be and his art method is included in the back matter. Expected pub date is October 31st. Kadir Nelson’s art is truly magnificent. You just want to stare at each one for hours and you’ll notice something new during the course of it. Spare text with plays on words portray an America that was the ideal foundation for a new country and its people. Author and illustrator notes are included in the back. Additional author notes with info on American symbols can be found in the author’s website which they should have found a way to incorporate into the book- even in the back of the dustjacket would be fine! Cute with text and pictures that will appeal to young readers. Avoid reading the copyright summary because it spoils the story’s twist. If you want a Kate DiCamillo-esque book along the lines of her Flora & Ulysses, pick up Anne Fleming’s debut middle grade novel The Goat. A large cast of memorable characters- including the titular animal living in the rooftop of a New York apartment building- inhabit this charming story about how lives intersect in the most mysterious ways. It may be difficult to keep track of all the storylines at first but it pays off in the end. It’s nice to get back to these familiar characters- although I didn’t have to wait almost twenty years since the last book in the series as the original fans had to. The characters are older. There’s a stronger sense of nostalgia even as they find themselves in new situations, new predicaments. Unlike the previous books, this is told in first person and through Michael Tolliver’s eyes. The audio book was read by the author and includes an interview with him- as well as a short infomercial of sorts about the importance of reading aloud to children and that publisher has a whole array of audio books for kids to choose from. The only thing I didn’t like was the weird musical segues from time to time. If Michael Tolliver Lives was a return of characters we’ve loved reading, Mary Ann in Autumn is a return to form to this special series. Not only do we get the serialized format that people either love or hate depending on who that chapter’s focus is but we also get the outrageous plotlines (and the it’s a small world mentality) that will keep readers hooked. Mary Ann faces an uncertain future while the past ends up clawing its way into her present. Mary Ann has become quite unlikable in the later books in the series so I was worried having the focus on her. Will she be redeemed? Or will the series’ heroine complete her downward spiral? You can view all the books I’ve read at my Goodreads page. Thanks also to Teach Mentor Texts and Unleashing Readers for their focus on Children’s Literature of this meme! 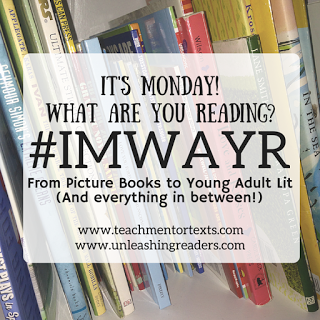 If you’re on Twitter, don’t forget to use the hashtag #IMWAYR when sharing your link! I just got Blue Sky, White Stars from the library. I’m sure it will be wonderful. The Allen Say isn’t out till the fall, Earl. You are lucky to have already read it, am sure it’ll be great, too. Thanks for sharing The Pie Contest & Magdalena’s Picnic. I’ll look for them! Have a wonderful week! Oh, Blue Sky, White Stars looks just wonderful, Kadir Nelson has such an incredible artistic style. And I’ve never read anything by Armistead Maupin, but you’ve got me so intrigued! Sounds like a fabulous week of reading. I am really looking forward to the Allen Say book. I love his work. I have also been seeing Blue Skies and White Stars mentioned a lot. I love Kadir Nelson’s artwork so will definitely be watching for this one. I am looking forward to the Allen Say book. I saw it mentioned on the Scholastic preview video but had forgotten about it until I saw it here! I’m looking forward to Blue Sky, White Stars! I’m really excited about this new Allen Say title. I have loved all of his other picture books. I’ve just put a hold on The Goat from my library. Blue Sky, White Stars Looks wonderful. I’ve never heard of Armistead Maupin, so thanks for the heads up.